At our shop we have now located our restoration and repair activities. With over 50 years experience in the antique and wood finishing trade we are uniquely placed to offer an extensive range of high quality traditional and contemporary wood finishing including antique or contemporary floor restoration, interior joinery and architectural woodwork such as staircases, panelling, skirting boards and doors. We offer sympathetic restoration and refinishing services (including French polishing) for both antique and modern furniture and servicing Sussex, Surrey, London and the Home Counties. At Lascombe French Polishing we pride ourselves in providing a personal and professional service. When calling us you will receive advice from an experienced tradesman, followed up with an on-site consultation at your home or place of business. Once options and our recommendations have been discussed, we will provide a free no-obligation estimate. 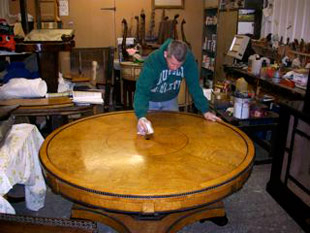 Lascombe French Polishing are experts at repairing and restoring both modern and antique furniture. We offer an on-site service within Greater London the Home Counties, or alternatively we can take furniture to our fully insured and secure alarmed workshops near Guildford, Surrey. Items we regularly work on include tables, coffers, drawers, chests, wardrobes, chairs and stools. We can also make bespoke pieces of furniture. Few floor sanding companies have the requisite skills to restore older wooden floors to their former glory. At Lascombe French Polishing, we can draw on techniques used to restore antique furniture and other wood fittings and fixtures, whilst still having access to the modern equipment needed to do a quick, efficient and dust-free job on contemporary floors. Whether you have an ultra-modern wide plank floor, an older parquet or herringbone floor, or even an antique or listed floor, our craftsmen will talk through the colour and finish options open to you. We can use either lacquers or oils depending on the finish you would like us to achieve.